Most plants that exist in the world today belong to the seed-producing plants, either flowering plants or cone-bearing plants. However, did you know that there is a diverse group of plants that produce a different reproductive structure called the spore? These are the ferns. Consisting of about 11,000 species worldwide, this group is very ancient. Fossil evidence suggests that this group has been around since the late Devonian period (roughly 350 million years ago!). Here at River Legacy, some ferns find a perfect home. Let’s now go back to the characteristic that sets these plants apart from the more common plants: spores. A spore is basically just a different way of plant reproduction. In essence, they function like seeds but they form in a separate manner. Rather than being associated with a fruit or a cone, these form on the underside of fern leaves or leaflets. They are significantly smaller than seeds and much more fragile. They are found in clusters called sporangia, which in turn form structures called sori that are seen underneath the leaves of a fern. When spores are released, they give rise to an intermediate plant stage called a gametophyte before becoming an adult fern. One of the native ferns at River Legacy is the bluntlobe cliff fern (Woodsia obtusa). 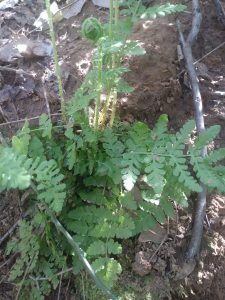 This fern grows in very moist habitats and is usually found on rocky surfaces, ledges, or slopes very close to a stream or another body of water. 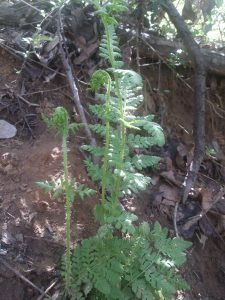 As you walk the trails at River Legacy Living Science Center, specifically the ones close to Snider Creek, see if you can spot this fern! ← Earth Day Is Here!